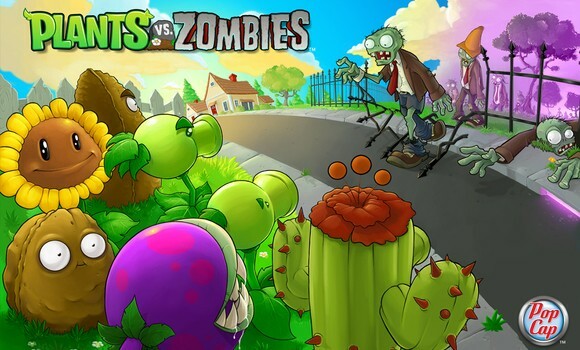 Me: *laughs* How would Plants ever beat Zombies?! That game sounds dumb. Me: (ridiculously bored waiting to get our taxes done) Are you playing that Plant Zombie game again? Brother: Yeah this game is awesome. Me: Hmm *side eye* Let me see for my self. Me: OMG I LOVE THAT GAME!!! …and my life hasn’t been same since. But seriously this game is so much fun! I don’t know anyone who has played it and didn’t think it wasn’t great. Now I’m one of those who never buys iPod touch games or apps, I have tons of “lite” versions because they never interested me enough to buy the full version or I’m just too cheap (except for Sally’s Spa that was fun). But PvZ (made by PopCap) was worth every 299 pennies that I paid for it, I figured I pay more for my coffee so that’s a good price. Don’t worry after you beat the game it isn’t over you get fun mini-games to play, quick play, the adventure mode again and in different version you can make your own zombie! The game is funny also and the difficultly keeps increasing as the levels progress so don’t let the cutesy-ness fool you. The best part of all is when the (unofficial) Michael Jackson zombie (Thriller style) pops up does a little Thriller dance number for you while resurrecting a dance team of zombies from the ground (see YouTube of it here). The first time I saw it I was so excited and thought it was one of the greatest things I’ve seen (more dramatics), then the “oh shhii” came because I realized I had more zombies to kill. But of course all good things must come to an end. The Jackson family wasn’t a fan of MJ being a zombie (even though the game came out before he passed away) so PopCaps just changed the MJ-lookin‘ zombie to a 70’s-lookin‘ zombie. PvZ is also coming to Xbox 360 for co-op and verses mode I’m not sure how they will do that but it will most likely be all kinds of fun. Also I found these adorable PvZ Plush Dolls on WalYou made by Alix. Too bad they aren’t for sale. hey dont judge, this game is so addicting. I have it for my mac, and ive beat it, twice, but i cant put it down.